New Toyota Corolla Altis is a flagship sedan for Japanese manufacturer, which has gained the title of world's best selling sedan. Recently, Toyota launched its 11th generation with revolutionary design and desirable luxury, providing a driving experience which surpasses all your expectations. Since 1966, this sedan is considered as the most loved car in the world. l As compared to its previous generation, the new Corolla Altis comprises more compelling and sportier looks. l Revamped radiator grille is complimented by the appointed daytime running lights and LED headlamps. l Its dual fog lamps gives a sublime effect integrated over the body-colored bumper at front. l The high-end variants of new Corolla Altis comes outfitted with impressive 16-inch alloy wheels paired with 205/55 R16 of tires. l Its distinctive facade measures 4620 mm x 1775 mm x 1475 mm (L X W X H), with standard wheelbase of 2700 mm. What to opt for: The new design language and understated styling parts of Corolla Altis depicts complete story about the car, thus a complete insurance on this new entry-level premium car is a good choice including all the additional parts. l The sedan by Japanese automaker features piano-black instrument cluster appointed with various equipments. l Its 3-spoke steering wheel is wrapped with soft leather for better grip and integrated with Bluetooth controls. l For entertainment purpose, this sedan has got 7-inch touchscreen and an audio system which can also be controlled through voice command. l To maintain a desired temperature inside, this sedan is equipped with automatic air-conditioning system. l The boot space of 470 litres can easily accommodate your baggage for additional convenience. What to opt for: The premium sedan is a cocoon of various classy aspects, hence a complete insurance of this cocoon will lead to optimal results. The consumables add-on serves as an additional benefit or you can also consider Invoice Cover Insurance for your premium Corolla Altis. 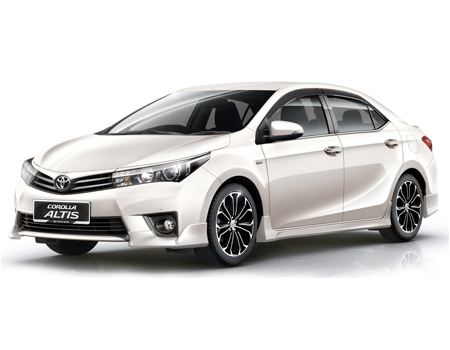 The Japanese manufacturer promoted its new Corolla Altis to strengthen its position in popular D-segment cars which comprises cars as Hyundai Elantra, Chevrolet Cruze and Volkswagen Jetta. The maintenance cost, aspects cost of new Corolla Altis suggests you to get a complete insurance of this vehicle which includes all its exterior and interior parts, whereas the liable and collision coverage offers full confidence for driving this car.